This is Part 2 of a 3-part series. Click here to read Part 1 and Part 3. Mouse engineers presented the latest models overexpressing the amyotrophic lateral sclerosis gene fused in sarcoma (FUS) at “New Frontiers in Neurodegenerative Disease Research,” a Keystone Symposium held 4-7 February 2013 in Santa Fe, New Mexico. These animals have been four years in the making. This is a long time even for mice (see ARF related news story). Part of the challenge was that the protein appears to regulate its own expression, so it was difficult to ramp it up to abnormally high levels, said Shuo-Chien Ling of the University of California, San Diego. Ling presented his model on a poster. Eric Huang of the University of California, San Francisco, introduced his new mice. These strains only partly recapitulate the pathology seen in human disease or other ALS models, dying young with moderate neurodegeneration. Scientists at the meeting puzzled over how they relate to human disease. Overall, FUS transgenic mice developed by multiple research groups exhibit signs of age-dependent, progressive motor neuron disease akin to ALS, such as difficulty moving, faulty coordination, muscle wasting, paralysis, and early death. Ling also found that pathology was dose dependent. Mild disease ensued from one FUS transgene, while severe symptoms developed in mice with two copies. Both teams observed that mutant FUS caused worse symptoms than wild-type, although the normal protein was sufficient to cause disease when expressed at high levels. This matches well with previous rat and fruit fly models, commented Udai Pandey of the Louisiana State University Health Sciences Center in New Orleans, who was not involved in the presented research. Together, the new and the old models suggest that FUS gains a toxic function when mutated, he said (Verbeeck et al., 2012; Huang et al. 2012; Xia et al., 2012). Huang’s mice express wild-type human FUS or an arginine-521-cysteine (R521C) mutation linked to human disease. By one to three months of age, their motor coordination began to suffer, their muscles were wasting away, and their neuromuscular junctions were losing their innervation. Most of the animals died a few weeks after symptoms started. However, Huang and colleagues were surprised to see the mice retained more neurons than typically seen in ALS models. At the end stage of disease they still possessed half the motor neurons normally found in the anterior horn, whereas in ALS models expressing mutant human superoxide dismutase 1 (SOD1), 90 percent of those neurons are gone at the end of life, Huang said. To investigate this discrepancy, Huang collaborated with Steven Finkbeiner of the Gladstone Institutes in San Francisco. The researchers cultured neurons from the mice and confirmed that FUS expression was less toxic than other proteins implicated in neurodegeneration, such as TDP-43 or huntingtin. They did see stunted dendrites in transgenic neurons expressing either mutant or wild-type FUS. Going back to the mice, the researchers stained tissue and saw stubby dendrites in the sensorimotor cortex and cervical spinal cord. This synaptic defect might explain the mice’s symptoms even if their neurons survive, suggested the researchers. How do Ling’s mice compare? They express wild-type FUS or the ALS-linked mutations arginine-514-guanine or R521C. These mice also retained more motor neurons than do other models. Although their motor control declined with age, they lived for a year or more. Limited FUS overexpression may make their disease mild, Ling said. Ling found that the human transgene dampened production of endogenous mouse FUS, keeping levels relatively low overall. Homozygotes with two copies of the human gene expressed about one and a half times the normal amount of FUS. Disease progressed faster in those animals. They had widespread neurodegeneration, losing about a third of their motor neurons and dying at 40 days of age. 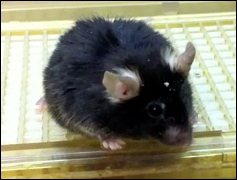 The results jibe with a recently published mouse model expressing wild-type human FUS (Mitchell et al., 2012). Those authors also observed that FUS transgenes turned down endogenous FUS production, and that two transgene copies were necessary to produce disease. And here, too, 40 percent of motor neurons remained in the lumbar spinal cord even though homozygous mice died by 12 weeks of age. What, then, do these mice tell researchers about the mechanism of FUS-based disease? In coimmunoprecipitation experiments, Huang observed FUS complexes. “The mutant protein has a higher propensity to form aggregates with itself and also with the endogenous wild-type protein,” he said. He proposed it could sequester normal FUS from its interactions with mRNA. Huang and Ling both observed mRNA splicing defects in their animals, and Ling’s homozygous FUS mutants showed splicing patterns similar to FUS knockdowns. Ling also saw accumulation of p62, which indicates blocked autophagy pathways. Ling suggested that FUS normally ensures RNA is properly processed. Altering FUS homeostasis would result in both a loss of this normal splicing function and a gain of toxic function, because excess FUS inhibits autophagy. This latter angle opens up a potential treatment strategy, Pandey noted, because the drug rapamycin induces autophagy. An immunosuppressant used to prevent transplant rejection, rapamycin is also under study as a potential cancer drug. Ling said no new mouse models for ALS fully mimic the human condition. Neither he nor Huang saw the widespread neurodegeneration and cytoplasmic FUS aggregates typical of the proteinopathy in people. Researchers modeling TDP-43 proteinopathy have made similar observations (see ARF related news story), and, of course, researchers in Alzheimer’s and Parkinson’s have for many years had to make do with partial models. ALS researchers have been “spoiled” by the SOD1 mouse, Ling suggested, with its rapid and severe disease resulting from one point mutation. Unfortunately, SOD1 mutations represent a tiny sliver of all ALS cases. For FUS and TDP-43 mice to better mimic human symptoms, they might require a second hit. “We need to make much more thorough models,” he said.